The previous issue of Justice League teased something huge. Now I won’t spoil that for you if you haven’t read it by now, but needless to say that Scott Synder has some major plans for how he wants to shape the DCU. 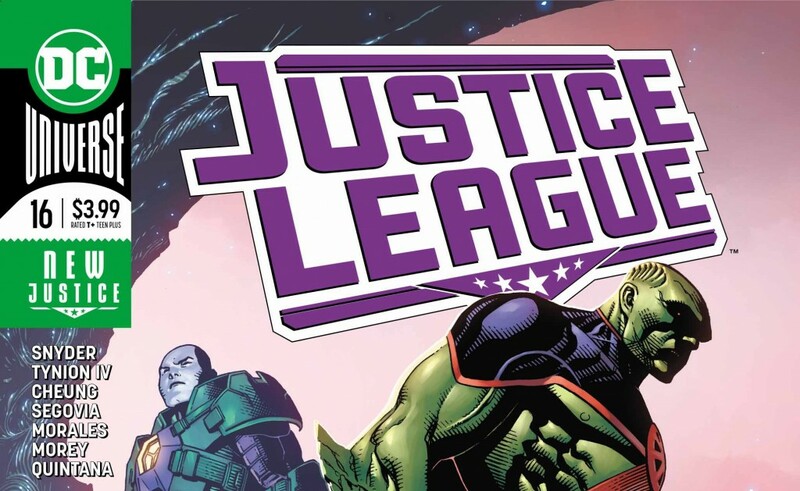 Justice League #15 was only the tip of the iceberg and this issue is a full on crash into said iceberg. Warning the following review will contain spoilers. So remember to read your comic before reading this review. You have been warned. If No Justice was any indication, Scott Synder wants to open doors that have been there all along, but have stayed hidden until the plot demands it. While I appreciate the scope of the story, this issue could be see as a retcon of past events and depending on what kinda reader you are, this issue might not sit well with you. Personally I’ve seen so many alterations of how the universe’s within superheroes that I just go with the flow. Regardless of your love for continuity or not, Synder and Tynion managed to make this exposition dump feel like a camp story telling a forbidden tale, the reader is gripped with anticipation with each reveal, and it’s all channeled through J’onn himself. J’onn acts as the surrogate for the reader, taking in news that not all is what he remembers nor do we. Plus I love how J’onn reacts to it, despite the fact he’s seen incredible moments over the course of his life, his reaction when he’s told that he’s part of this grand cosmic plan is a reaction anybody would have. That disbelief that your small existence was never small at all is captured perfectly with how J’onn handles his newly handed fate. Sure he composes himself but you can still feel the tremendous weight that he now carries. So while you might not agree with yet another tale of events untold, coming to light it can’t be denied that at least Synder and Tynion are doing their best to give a sense of weight to revelation of this new threat coming to face our heroes. One scene that will have Green Lantern fans paying attention is the verbal confrontation between Kilowog and John. Thankfully this moment doesn’t lead into a pointless fight between them, but rather it serves as a character moment for John. I’ve never known John Stewart to be the most verbal with his inner emotions, and it doesn’t feel out of character for him either. It’s hard to have character moments within books like Justice League due to the amount of characters of the size of the story, so while this was a small scene it was great for John within this series. While I praised the duality of two artists last time, I really wish I could say the same for this issue. Granted the transition between Stephen Segovia’and Jim Cheung’s pencils, it still a bit jarring to go from one distinct art style to another when it’s still the same scene. Regardless of that minor complaint, I hope Segovia becomes a regular artist for Justice League. His storytelling is pretty great, his facial expressions an body language are stupendous. My personal favorite is how he handles J’onn after the secret of the universe is told to him, just by the art alone you feel the weight that he now carries. Segovia might not be a name people will recognize like Jim Cheung, but that doesn’t mean his art should be overlooked either. Even though this was a dialog heavy issue, I still felt deeply engaged. Sure the idea of another hidden secret history might not sit well with some fans, but if you did not mind it, then this issue will have on the edge of your seat. The real ride for Scott Synder’s Justice League is about to begin.